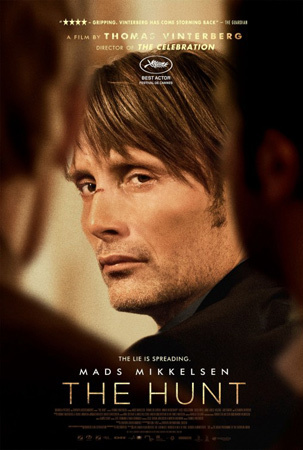 My top pick for this week is Thomas Vinterberg's "The Hunt", starring Mads Mikkelsen. It's a film that premiered at Cannes last year and garnered the festival's Best Actor prize for Mikkelsen. A year later, the film finally hits theaters across the pond and we can now share in the enthusiasm for this fine film. The movie follows a brief period in the life of a schoolteacher who is wrongfully accused of sexual abuse by one of his young female students. After rejecting her inappropriate advances, she decides to fabricate a lie in retort. Her vivid imagination manages to convince some of the higher powers in the school system and it launches a whirlwind of drama for this innocent man. As the lie spreads, it changes significantly to the point where all of the children are now accusing him. It's shocking to watch, exposing some of the ugliest elements of human behaviour. Although the lie started with this young girl, its escalation was primarily the result of the vivid imagination of the adults, not the child. This fact perfectly illustrated how the smallest doubt can give you such strong conviction. There are several brilliant moments in the film where you can see the characters thinking. You can sense their internal debate as they make up their minds about Lucas. Likewise, you as the viewer will often wonder what you would do in the same situation. If you were to cut out the pre-confession segment of the film, it would change the movie significantly. Klara (the accuser) is so utterly convincing that the film would have become a psychological mystery as you would try to ascertain his guilt. Child molestation is such a serious issue and the film emphasizes this through all the vicious antagonism that he endures throughout the community. As the film shows, even some of your close friends will turn their backs on you (Klara is actually his best friend's daughter) based on the mere suggestion of child abuse. The film isn't completely oppressive in its indictment of human behaviour though, thanks to the inclusion of some kind-hearted, rational people. Mads Mikkelsen's performance has been lauded by many and he deserves all the praise, but honestly there was so much else going on that I could barely focus on him to fully judge his acting. Mikkelsen was obviously doing strong work though, skillfully showing how these allegations can destroy your life forever. I almost wanted to criticize him for being too placid at times, but he makes perfect acting choices throughout. In these situations, sometimes all you can really do is sit back and hope that people come to their senses. One of the main criteria for a good film is its ability to suspend your disbelief. I've read other critics dismiss the film as an exaggerated witch-hunt, but I completely disagree. Based on what I saw in this film, I am convinced that this could easily happen in real life. We're naturally predisposed to believe a cute little girl when she claims abuse (especially when she vividly describes something that she shouldn't know about). Heck, I think I'd believe her myself and this simple truth terrifies me. Heart-breaking flick, but also a signal of inspiration where you can be at your lowest peak and yet, still overcome if you believe in what's true. Pretty hokey to think about, I know, but at least that's what part of the film I connected to with the most, even when everybody were acting like complete jackasses. Nice review. Great review. One of the things that angered me most about this film was the placidity of the main character, which I'm glad you touched on. But it angered me in an appreciative way. I really think that is how THAT guy would've responded. What a scary little film. Saw this a couple of months ago and it was a very well made movie. I also saw the documentary Witch Hunt (http://www.imdb.com/title/tt1196112/) which is about real people who went through something like this and actually went to jail while they were innocent.